Over years, garage is full with stuff. My wife and I finally had garage sale last month and we need better ways to store stuff. 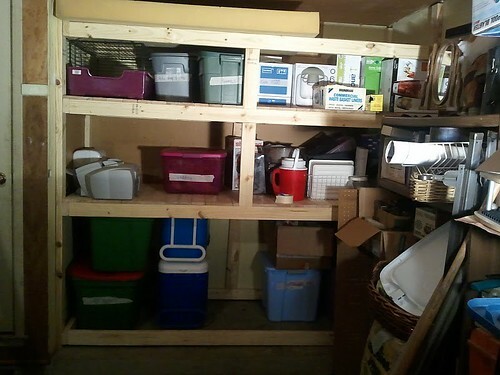 (Hint: room for saw table in near future) I finally did garage shelves last two weeks. (Little by little due to my crazy work schedule) I think it looks awesome!!! With some ideas from several different website on garage shelves and I made some adjustment because I want it to be full wall to wall as you can see in those pictures. I don’t care about original wall itself, old paint, holes and others. I build shelves just like that. All three wall sides — I used 2 ½ screws to attach the 2×4 studs wall inside. For outside 2×4 stud parts, I used Kreg jig to support each other. It works very well. I decide to use 1×4 wood planks to create shelves for middle two tiers. It’s easier to do this way than install plywood. However, I probably will install plywood on top tier but I haven’t decided yet. Bottom part is 3 feet height, plenty for stacked two boxes and others. Middle two tiers are more of smaller boxes and other odd stuff. Top tier is more of used for ladder and other long items. I am pleased with it!! What do you think? See 34 pictures slideshow via Flickr – Click here. Approximately, two years before our father passed away, dad told us that his cemetery was taken care of. Dad even talked to us few times over time that it’s paid for. We don’t have to worry about funeral expense. We all believed him – no reason to doubt with his father. He usually took care his business with no problem in the past. Wrong. It’s almost a month since dad passed away. Youngest brother and Grant have learned so much about the funeral home and cemetery. The whole paperwork that dad signed was just for cemetery itself. (Vault and digging) Of course, we did not know much about it – completely clueless. Until Grant and his youngest brother came to funeral home and had the meeting with a funeral director for four-hour – thanks to his brother who help interpreting whole time. We may never know why our father thought funeral expense paid for, but it wasn't. It was our expensive lesson. Make sure it doesn't happen to you! We want to thank everybody who gave us cash donations – all of it will go to funeral expense and misc. See a list (below) – thank you for all helps! By the way, director at funeral home (Texas) told us that anybody can pre-plan arrangement early. We would save a lot this way. For example, cremation package, only $30 a month for 10 years or burial package – only $70 a month for 10 years. However if this person died within 10 years, it’s paid for automatically. Please share you funeral home experience with us! P.S. Dad, I love you and miss you very much!